The Kwara Police Command has confirmed an attack on the campaign train of the Vice President, Prof. Yemi Osinbajo, on Thursday in Ilorin. The Public Relations Officer of the command, DSP Ajayi Okasanmi, confirmed this to the on Thursday in Ilorin. 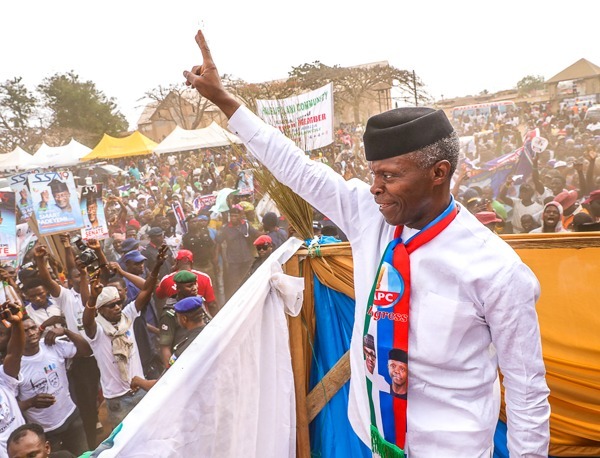 He said the Vice President was not at the scene where the unknown gunmen shot at the mammoth All Progressives Congress (APC) supporters, who came out to hail the Prof. Osinbajo at Isale Aluko area in Ilorin. The Kwara Police spokesman confirmed that two persons sustained gunshot injuries while others who ran for safety suffered various degrees of injuries. He said first information available to him has it that the attack was allegedly carried out by the People’s Democratic Party (PDP) thugs in the state. Okasanmi said investigations into the matter had begun and promised that the police would unravel and bring those involved to justice. Vice President was in Ilorin to conclude the door-to-door campaign to mobilise votes for the reelection of President Muhammadu Buhari. Meanwhile, Kwara PDP has denied involvement of its members and supporters in the attack on the vice-president. The denial was contained in a statement by the party’s Publicity Secretary, Mr Tunde Ashaolu.